This week, Tuesdays with Dorie is celebrating Purim with Lauren Groveman’s Rugelach! (I know it should be hamentaschen, but that one’s not in the book.) Anyway, we made rugelach in the last round of the group, but that was years ago now, so I was more than ready to make them again this past weekend. This version’s quite different, as it turns out. Most noticeably, these rugalach are round spirals, not cresent-shaped. They’re formed from slice-and-bake-style rolled logs. And they are stuffed–almost bursting– with good things. Things like cinnamon sugar, nuts, dried fruits and apricot or prune lekvar (a thick jam/fruit butter). I went with walnuts, golden raisins and prune butter. What with making the cream cheese dough and prepping the list of fillings, this recipe has a lot of steps, but you can make it a little easier on yourself if you want. I made my dough the night before, and toasted my walnuts then, too, since I already had the oven on for dinner. The one big shortcut I took was that I used a plum butter that I had bought at the Grenemarket in place of making my own lekvar. I’d had that little jar of plum butter open in the refrigerator for months, so I was glad for the excuse to finish it off. It was the consistency of a thick prune paste, anyway, so I thought it would work perfectly, and in fact any thick store-bought jam would likely do just fine. Also, I admit I didn’t measure anything related to the fillings. I used good judgement and eyeballed it all. I also eyeballed the amount of filling I put into each dough roll-up. I know when enough’s enough and I didn’t want my spirals to unravel or explode. These taste great. The flavors are big and warm, so I’m glad we made them while it’s still chilly where I live. They’re thick cut, so they’re nice and sturdy. And I am in love with the prune swirls…it looks like a letter “C” in each cookie. So cute that even though the cookies are supposed to be completely coated in cinnamon-nut sugar, I didn’t want to hide the tops. Instead kept the sugar concentrated on the outside of the cookies and just sprinkled a bit on top. Here are my rugelach pointers: With all the cream cheese in the dough, it gets soft fast, so I didn’t hesitate to left it have a rest in the fridge at different stages of rolling and filling. The dough rolls up best if the chunky things like nuts and dried fruit are chopped pretty fine. When these guys bake, there’s a lot of jam and sugar that gets caramelized on their bottoms, and it’s best to get them off the baking sheet and onto a cooling rack as soon as you can so they don’t get stuck. They’re sturdy enough to handle almost right out of the oven. For the recipe, see Baking with Julia by Dorie Greenspan or read Margaret’s The Urban Hiker and Jessica’s My Baking Heart, as they are co-hosting this week. Don’t forget to check out the rest of the TWD Blogroll. P.S. : For something totally unrelated, enter my BOOK GIVEAWAY for a chance to win a copy of Marshmallow Madness! looks lovely …. !!!!! you did a very good job … loved these cookies !!!!! yes, a lot of steps. I did the dough/toasting of nuts/lekvar the night before as well, so that most definitely helped out! This looks great, I didn’t use all the filling either because I thought it was too much!! Two things; These look completely fabulous and I totally should have baked mine on the side like that. Not sure what I was thinking. I love the look of these! Steph – these are just GORGEOUS! I really like that you didn’t do the cinnamon sugar mixture everywhere, they look pretty with the contrast. Yeah, mine kind of exploded. 🙂 Yours look awesome! so jealous! beautiful little rolls! Your rugelach are the first I’ve seen that turned out pretty successful. Kudos! Gorgeous! Now I’m heading over to the post to win that book! It looks so fun. 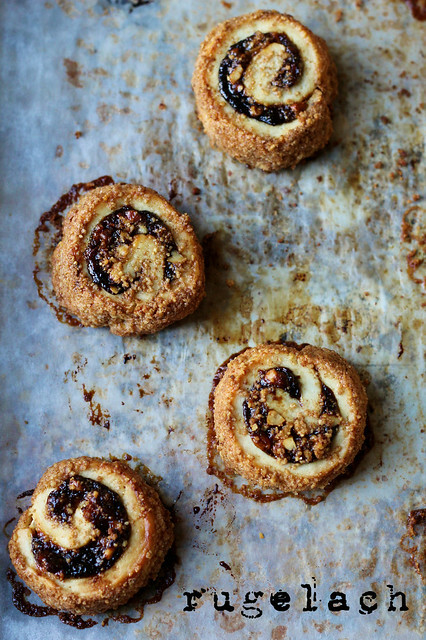 I fell in love with the rugelach from Dorie’s BFMHTY, but this recipe looks even more intriguing! I like the little cinnamon bun-like shapes, and the idea of using plum butter…yum. I definitely agree that these are a winter food. I skipped adding additional dried fruit and was so pleased I did it. They were just perfect! Yours are lovely! Much nicer than mine. What a great spiraling effect in your cookies! Ours didn’t spiral so nicely even though we held back a little on the fruit and nuts. We’re going to make our rectangle wider next time so that we can get more spiraling. Beautiful! Good call on cutting down the filling. Your rugelach look great! I loved the prune lekvar too. I love your photo and how you incorporated the word Rugelach set in a unique typeface to complement the parchment paper background. That picture is just perfect. Funny, I was just talking about hamentaschen today and that I was surprised the local bakery didn’t have them in stock like they usually do this time of year. I’ve never seen a rugelach shaped like this, but, that said, they look wonderful. A very inauthentic, but delicious, filling, is dark chocolate with chopped nuts. Thanks for the tip about taking them off the pans right away. I had big troubles with mine sticking, but they worked out beautifully anyway! Beautiful spirals – and I bet they taste lovely too! Very pretty. And what a thick, tempting layer of the prune butter. Beautiful!! Great “C’s”! Love your photo – it could be a book cover…. How lovely your spirals turned out – well done! Your photography alone is always worth a visit…your Rugelach look beautiful! They look yummy! I hated to miss this one. Beautiful Rugelach – and a great photo! Gorgeous all around the world Cs! Your rolls are lovely-& I bet were extra yummy. I made the apricot lekvar- it was outstanding! Beautiful! I love that picture. I’ve had that cookbook for years and have yet to try that recipe. Looks fantastic! Your rugelach look amazing – absolutely perfect. I loved these.